Monin Classic Flavored Syrups are available in flavors such as Lime, White Peach and Vanilla. 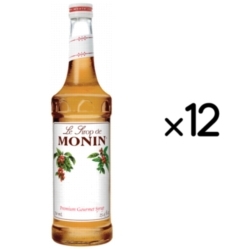 Monin syrups are made with natural ingredients and contain only fruits, nuts, spices, water, and sugar. Comes as a case with twelve 750ml bottles. $0.31 / oz. $0.30 / oz. $0.28 / oz. $0.25 / oz. Due to levels of acidity, some flavors are not recommended for use with dairy (milk, cream, half & half) and some are only conditionally recommended. See below. Pomegranate, Passion Fruit, Rose, Red Sangria, White Sangria, Watermelon. INGREDIENTS: Pure cane sugar, water, vegetable glycerine, natural flavors, turmeric xanthan gum, organic cinnamon. INGREDIENTS: Pure Cane Sugar, Water, Jasmine Flavor.